Helps reduce oxidative stress-related damage. Has shown potential for treating arthritis and rheumatoid arthritis. Superoxide dismutase (SOD), together with glutathione peroxidase, is the second largest class of antioxidant enzymes produced in the body. It has the ability to protect tissues and cells from a particularly dangerous free radical, anion superoxide, the starting point for the free radical chain of production. SOD converts anion superoxide into a less active and aggressive entity - hydrogen peroxide - which is then rapidly catabolised in water. ¤ Since its discovery in 1968, numerous studies have been conducted on SOD and its potential health benefits. It was first used in an injectable form to treat arthritis in adults, respiratory problems in children or as an adjunct treatment for cancer. Studies have shown that SOD has a powerful regenerating effect on thickening or hardening of tissue caused by age, disease or injury. ¤ Supplementation with SOD should therefore, in theory, help the body fight against oxidative stress and its associated diseases. Unfortunately, because of its fragile molecular structure, it is inactivated in the digestive tract, and the challenge so far has been to produce an SOD nutritional supplement that remains active when taken orally. > SOD-Gliadins Complex is the first form of orally-delivered SOD which has been proven to retain its activity following absorption. The SOD is first obtained from a melon extract. Its activity is then preserved and its bioavailabilty ensured by an innovative galenic formulation using a wheat protein extract, gliadin. Gliadin is a vegetable polymer which retains the active principle and delays its release into the small intestine. It releases SOD progressively and facilitates its passage across the intestinal mucuous membranes to the blood supply. This oral bioavailability has been supported by several animal studies and by a clinical human trial (on 20 healthy volunteers). The animal studies also showed that SOD's pluripotent antioxidant, anti-inflammatory and immunomodulatory properties were clearly evident following absorption of SOD-Gliadins Complex. 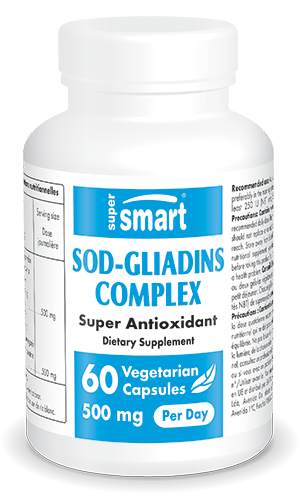 > SOD-Gliadins Complex represents a unique advance because SOD activates, in a number of ways, our own endogenous antioxidant defences. It does not become rapidly saturated like secondary, dietary antioxidants that intercede later in the free radical chain. It is particularly recommended when the body's natural defences are compromised: elderly people (boosting their general condition), sun exposure (allergy prevention), tobacco addiction, stress, intensive physical exercise. Other ingredients: rice flour, calcium carbonate. Take one or two vegetarian capsules a day, preferable in the morning on empty stomach, as required, or as advised by your therapist. Attention: This product contains wheat proteins and should therefore not be used by those who are gluten-intolerant.